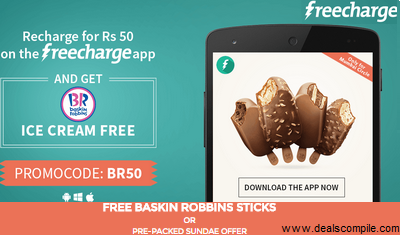 Mumbaikars, Recharge for Rs.50 or more on the FreeCharge App and Get Baskin Robbins icecream absolutely FREE. 3.The mobile number which is recharged will receive a unique e-code via SMS which entitles a FREE Baskin Robbins Stick worth Rs.85 OR a Pre-packed Sundae worth Rs.99 valid across select Baskin Robbins parlors in Mumbai. -Valid only once per unique mobile number. -For transactions made through Debit/Credit card only. -Offer Valid Till 30th April.